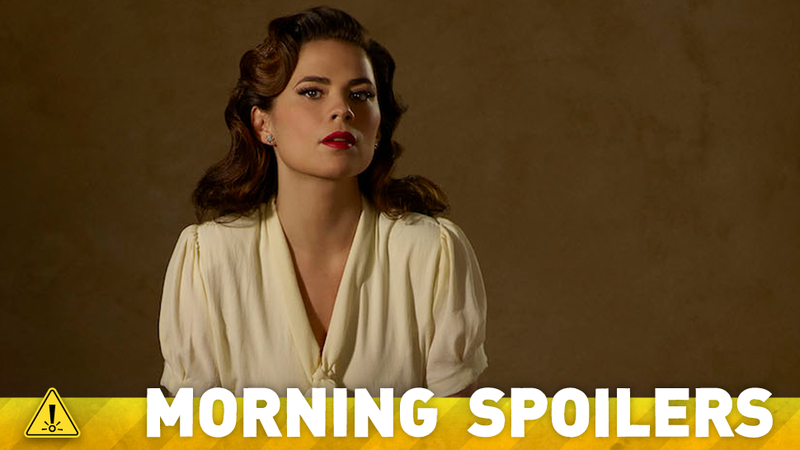 New Agent Carter pictures tease the show’s new villain. Zack Snyder talks Batman v Superman spoilers. An Arrow character is heading to The Flash. Mark Millar’s Superior adaptation gets its writers. Plus, what’s to come on The X-Files, and The 100, and new Legends of Tomorrow clips. Behold, Spoilers! I have the benefit of seeing the movie. It’s cool that they think it’s too much and I appreciate people not wanting to know, but there’s plenty that they don’t know. There’s a lot of movie that’s not in the trailer. Of course I hate it when any spoilers come out! You design the movie as a story that evolves as you watch it, so moment-to-moment [you’re thinking], ‘Oh my god, what’s going to happen next? Are they gonna live? Are they gonna die?’ So you want that experience for the audience, as much as you can. If you’re, as an audience member, exploring these articles, looking for answers to questions that you have, maybe you’re okay with knowing before you go. It’s like an individual taste. But like I said, I want people to see the movie without knowing. We see glimpses of something called the Dark Dimension. If you were to open a ‘Doctor Strange’ comic drawn by Steve Ditko, you would see the Dark Dimension is, in fact, very colorful in an extremely psychedelic way. Those are the things we’re not shying away from. Here’s a new teaser trailer for the horror sequel. [David and Dan] sat down and had a big pow wow with George a couple years ago in case of this eventuality. You know, George is a producer on the show so... Maybe A to B, they go off on slightly different tangents, but B is still B.... I think they’re all on the same page-ish. The Diggles arrive in Central City to help Barry take on King Shark who has escaped from ARGUS and is hellbent on completing his mission of destroying The Flash. Three months have passed since the tragedy at Mount Weather and our heroes learn that a bounty has been put on Clarke’s (Eliza Taylor) head. Unbeknownst to Clarke, a team led by Bellamy (Bob Morley) and Kane (Henry Ian Cusick) journeys deep into Grounder territory to save her. Meanwhile, Murphy (Richard Harmon) finds his way to the mansion and discovers a very different Jaha (Isaiah Washington) on a very different mission. When a scientist suddenly commits suicide, Mulder and Scully investigate what unseen force may have driven him to it. What they uncover is a laboratory where extreme genetic experimentation has been going on for decades, breeding subjects who possess unexpected and dangerous powers - and who harbor deep resentments in the all-new “Founder’s Mutation” season premiere, part two, episode of THE X-FILES. TV Line has unveiled a gallery of cast pictures from the second season, giving us our first look at Wynn Everett as Whitney Frost—better known to comic book fans by her villain persona, Madam Masque. More at the link. Finally, here’s a couple new promos, focusing on Carter Hall and Kendra Saunders, aka Hawkman and Hawkgirl.